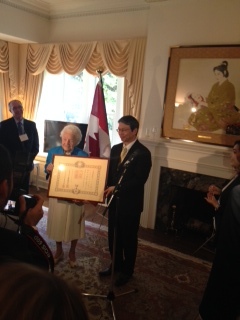 The Order of the Rising Sun, Gold Rays with Rosette was presented to Mayor Hazel McCallion at a special ceremony yesterday evening at the residence of the Consul General of Japan in Toronto. “I am grateful to Mayor McCallion for her strong leadership in supporting the approximately 80 Japanese businesses currently in Mississauga. This, together with her commitment to Mississauga-Kariya relations, will be remembered for decades as her important contributions to Canada-Japan relations," said Consul General Yamamoto. Mayor McCallion has been awarded this decoration by His Majesty the Emperor of Japan for her contributions to Japan-Canada relations through her welcoming support of Japanese businesses in Mississauga. It also recognizes her invaluable participation in the sister-city initiative between Mississauga and Kariya, Japan, which were twinned in July 1981.